Miss M had an invite from a friend and was scheming up ways she could attend. It was decided by one and all that the whole family should go so a gumboot inventory was duly executed (Fieldays and gumboots go hand in hand (or is that foot in food?)). 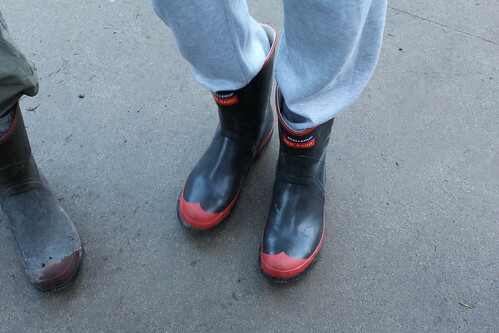 Mr L was the only gumboot-less member of our family so a quick trip to the local hardware store saw him equipped with a brand new pair of Red Bands. As Mystery Creek is a fair ways from our house, we decided to make a weekend of it. We invaded the sister-in-law’s house and caught up with the FIL & his partner, had dinner with some old friends and made some new friends as the old friends had relatives staying. After a very late arrival in the Waikato, we set our alarms for a very early start so to avoid sitting in traffic queues for hours. 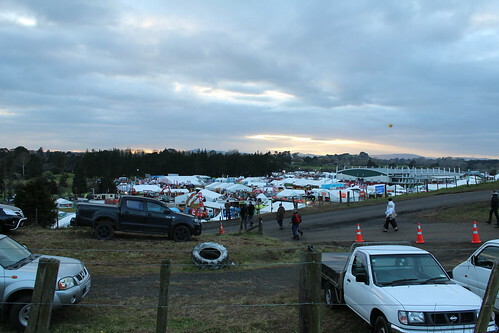 It turned out to be a good idea as we were ahead of the rush and we got into the Fieldays nice and early. The first stop was finding a toilet….as we do…. then on to the show homes as Miss M lead us through each and every one of them. Armed with a map and the Fieldays App, it only took us a couple of hours to manage to meet up with some young friends. 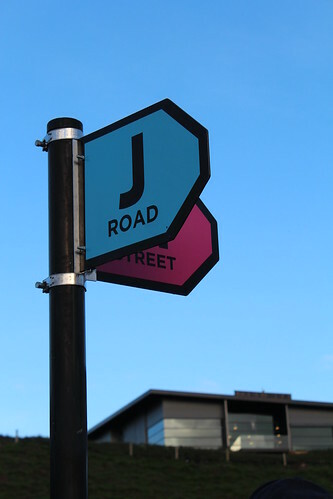 Once the meeting point was established, we managed to divest ourselves of one offspring. We wandered around admiring flash jeepy-type vehicles and enormous tractors; and chatting to friends and family as we ran into them. 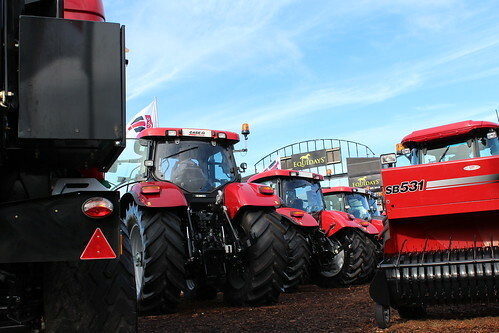 It is quite amazing to think, that of the 30,000-odd visitors through the Fieldays on any given day, we stopped and talked to about 30-40 people that we knew. New Zealand is a small place. I seem to remember the tractor pulls being much more exciting that watching two very large tractors pulling a tray of heavy weights down a mud track and had talked it up as a big event but the boys enjoyed it. Miss M was very keen to check out the Farming Bachelors competition alas the group she hung out with were less interested – perhaps because they were predominantly male. I was very interested in anything food related, of which there was plenty. I happily strolled through the huge shed full of stalls offering cheese, wine, olive oil, smoked garlic & black garlic, fudge, herbs & spices, limoncello and plenty more. 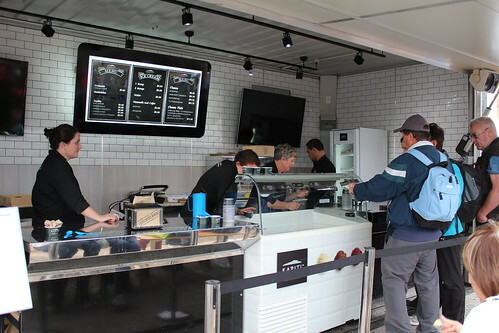 The highlight of the day for me was the Kapiti Ice-Cream stall. We were dithering about trying to decide if we had had enough and it was time to go or whether we should look around a bit more when I spied a black shipping container. The stall took my interest simply because it was a black shipping container that was selling food. 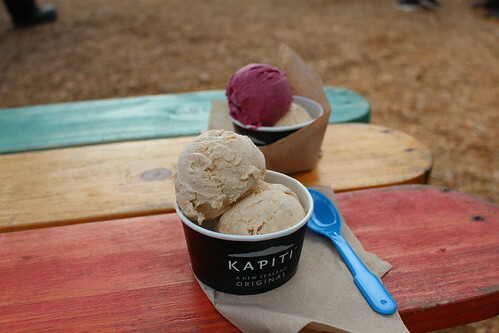 Then I really took notice when I discovered it was Kapiti Ice-Cream and they were selling ice-cream by the scoop. Anyone watching us would have been rather amused to see the five of us scarper across the intersection after I exclaimed quite loudly “Ice Cream”. Never-mind the wind chill factor was increasing by the minute and the sun was slipping from the sky – the day could finish once ice-cream was consumed. We each had a double scoop of ice-cream. The Anster chose Summer Nectarine for both scoops, while Miss M had Black Doris Plum & Creme Fraiche. Mopp couldn’t decide so he had one scoop of apple & one scoop of plum. I forget what Mr L had but it must have been good as he practically inhaled his then polished off his sisters portion. And I, of course, had the Spicy Apple Crumble. 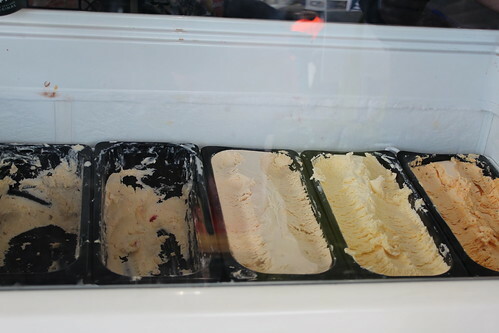 – 7Apples Gelato: not a recipe but what a cool name for a gelato shop….. when am I going back to Saint Kilda?? 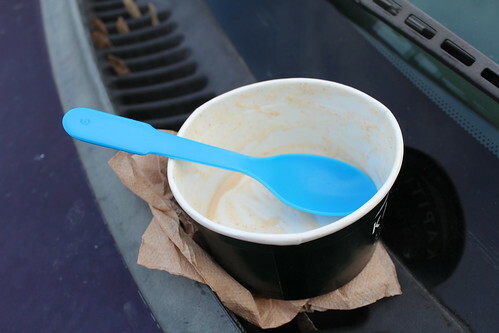 This entry was posted in Gisborne Life, Product Review and tagged Kapiti Spicy Apple Crumble Ice Cream by Jo Dohrman. Bookmark the permalink.